Roberts Space Industries has big plans for the Star Citizen damage model, which it discussed in detail in a lengthy update you can read here. Or you can do what I did instead: Skip all that and go straight to the video of various ships being chewed to pieces in excruciating and beautiful detail. 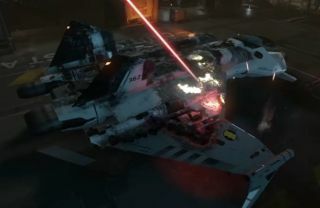 The update gets a bit technical in spots but the short version is that damage modeling in Star Citizen will now employ four different "damage values"—temperature, burn, thickness, and deformation—to "make the the hull glow with heat, make paint burn and bubble, peel paint off to expose the underlying metal, dent and deform the surface, and even cut holes through the hull to expose the internal wiring and mechanics." RSI said the new modeling system will allow it to push for more realistic graphics across the board, without sacrificing performance. "We've trialled this tech on the Gladius, and you'll see for yourselves in [update] 1.1.0 that the results are great," it wrote. "What you might not see is that the Gladius uses four times less memory than the other ships, and this equates to better performance for the backers." The studio plans to push the tech further in the future, "adding more effects under the skin of the ship as gaping holes are revealed, adding touches like sparks on damaged equipment under the skin." Hammering a ship while it's docked may not make for the most exciting action ever, but it's a far better way of showing off the infliction of damage, and results thereof, than an actual dogfight. And it does look very good indeed—which I guess is to be expected when you're given $75 million to make a videogame. During the Star Citizen backers event this past weekend at PAX East, Chris Roberts also joked that one might be able to write their name on someone else's ship if they were accurate enough—Star Citizen's ultimate form of teabagging.